Bidding has been fierce on many of the nearly 300 items available in the 11th Annual ARRL On-Line Auction, which continues through Thursday, October 27. There is still time to bid, but the clock is ticking down. Each auction item has its own closing time. This year's auction inventory includes some vintage ham radio items, including a Collins S-Line, which has been attracting many bids. Among other premier items from the QST "Product Review" stock are the new Elecraft K3S HF+6 meter transceiver, an Ameritron ALS-1306 HF/6-meter amplifier, and the new Icom IC-7300 HF+6-meter transceiver. Also on the block is a RigExpert AA-230 ZOOM 0.1-230 MHz antenna and cable analyzer, and an autographed script from the TV show Last Man Standing, starring Tim Allen, KK6OTD. There are books and publications -- including many vintage editions of the ARRL Handbook, among them a special 1942 defense edition and a 1926 edition. Bid on embroidered ham call sign caps and ARRL-branded gear too, from playing cards to iPhone chargers and even glassware. Proceeds from the yearly On-Line Auction benefit ARRL education programs. These include activities to license new hams, strengthen Amateur Radio Emergency Service (ARES) training, offer continuing technical and operating education, and create instructional materials. Participants must register. Those who have participated in past ARRL On-Line Auction events may use their previous login information. Clicking on the "Help" tab will offer password and user ID-retrieval instructions. Bidders also should ensure that a correct address and other information are on file. The auction site only accepts Visa and MasterCard. Bidders are urged to read the auction policies. Philippine Amateur Radio Association (PARA) Ham Emergency Radio Operations (HERO) network volunteers were ready for Super Typhoon Haima, which struck the northeastern Philippines on October 19 with winds peaking at more than 180 MPH prior to landfall -- a category 5 storm. Roberto Vicencio, DU1VHY, reported that HERO had already activated its net on 7.110 MHz for an earlier category 3 storm, Typhoon Sharika, which hit Luzon Island before moving west and weakening. But the powerful Haima forced thousands of residents to flee. More than a dozen deaths in the Philippines were blamed on the storm. "Considering the limited access to other communication channels, ham radio is being used to support affected communities to communicate with their loved ones and provide feedback to their evolving needs," the UN Office for the Coordination of Humanitarian Affairs (OCHA) said in a report. The latest of a dozen storms to hit the Philippines archipelago this year, Haima left in its wake a path of debris, destroyed infrastructure, some 46,000 damaged homes and businesses, flooding, and landslides. The storm also had an impact on agriculture and fishing. ARRL Emergency Preparedness Manager Mike Corey, KI1U, was recognized by the Guayaquil Radio Club (GRC) of Ecuador for coordinating the work of ARRL and several other radio amateurs to provide Ham Aid equipment to Ecuador this past spring, following the magnitude 7.8 earthquake in April. From left to right, ARRL President Rick Roderick, K5UR; Guayaquil Radio Club President Lorenzo Lertora, HC2BP; ARRL Emergency Preparedness Manager and IARU Area B Emergency Coordinator Mike Corey, KI1U; Guayaquil Radio Club Treasurer Victor Perez, HC2DR; Mario Proaño, HC2TMP, and ARRL Second Vice President Brian Mileshosky, N5ZGT. "It was quite a surprise and honor," said Corey. "The recognition really goes to the team that made it all happen -- here at ARRL Headquarters, Ken Bailey, K1FUG; Sean Kutzko, KX9X, and Tom Gallagher, NY2RF, and in South Florida, Jeff Beals, WA4AW, and Kenny Hollenbeck, KD4ZFW. And most of all, Gunter Chanange, HC2CG, and the members of the Guayaquil Radio Club, who did the real work." Presenting the award during the IARU Region 2 General Assembly in Chile was GRC President Lorenzo Lertora, HC2BP, who is also Ecuador's deputy defense minister. Lertora said the equipment provided through Ham Aid allowed Ecuadorian Amateur Radio volunteers to help a Venezuelan Air Force plane carrying search-and-rescue personnel and equipment to land safely at an airport that had lost all power and communication. Some 400 pounds of Ham Aid Amateur Radio equipment valued at more than $7,500 was shipped from ARRL Headquarters to Ecuador in early May to support relief and recovery efforts under way in the wake of the major earthquake that struck the South American nation on April 16. The disaster destroyed or compromised electrical power and commercial telecommunication systems and rendered many roads impassable due to earthquake rubble. The battle continues between Radio Eritrea (Voice of the Broad Masses) and Radio Ethiopia, which is said to be jamming the Eritrean broadcaster with broadband white noise. The problem for radio amateurs is that the battle is taking place in the 40-meter phone band -- 7.145 and 7.175 MHz -- with the jamming signal reported by the IARU Region 1 Monitoring System (IARUMS) to be 20 kHz wide on each channel. The on-air conflict has been going on for years; Ethiopia constructed new transmitting sites in 2008 and is said to use two or three of them for jamming purposes. The interfering signals can be heard in North America after dark. According to IARUMS Region 1 Coordinator Wolf Hadel, DK2OM, Radio Eritrea is airing separate programs on each frequency. He said in the IARUMS September newsletter that telecommunications regulators in Germany, Austria, and Switzerland have been informed, so they could file official complaints. Other AM broadcast intruders on 40 meters include Radio Hargeisa in Somaliland on 7.120 MHz, which, Hadel said, is even audible in Australia and Japan. 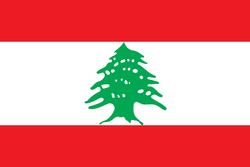 He further reports that the Voice of Iran's signal on 7.205 MHz is splattering up to 5 kHz on either side of its channel, while Radio France International, which operates on the same frequency, is splattering down to 7.185 MHz. Read more. The International Space Station (ARISS) program has announced that the Ericsson MP-A VHF handheld transceiver that astronauts had been using to speak via Amateur Radio with students and educational groups around the world for more than 16 years recently began displaying an error message, rendering it unusable, at least for now. While the ARISS technical team is looking into how to restore operation from the ISS Columbus module, it will support ARISS contacts from NA1SS using the 25 W Kenwood TM-D710 transceiver in the Russian Service Module. Cosmonauts have been using that radio to carry out their ARISS school contacts from RS0ISS. For the time being, the packet digipeater, which relied on the Ericsson transceiver, will be unavailable. Switching to the 70-centimeter capability in the Columbus module for some operations is being coordinated. New ISS ham gear is on the way, though. 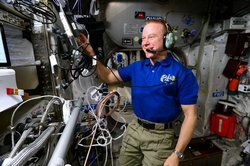 Astronaut Tim Kopra, KE5UDN, uses the Ericsson VHF transceiver from NA1SS to speak to students on Earth during his ISS duty tour in early 2016. 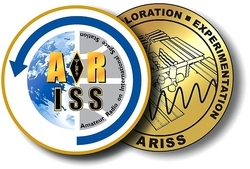 "ARISS is actively working on a new Interoperable Hardware System for the ISS. The primary components are a modified JVC Kenwood D710GA radio and a custom ARISS-designed power supply," ARISS Operations Committee Chair Dave Taylor, W8AAS, said in an AMSAT Bulletin Board post. "The radio is complete except for final programming and NASA testing and certification. The power supply design is in final stages, and a hardware prototype has been built. It will power existing and anticipated ARISS equipment." On October 21, the ARISS hardware team held a Technical Interchange Meeting (TIM) for the Interoperable Hardware System. In addition to domestic and international ARISS Technical Evaluation and Support (TES) Committee members, subject-matter experts from NASA attended to provide advice. A retired NASA Space Communication and Navigation engineer was also on hand. "With this milestone completed, we will move forward with the design process and finalize the design with a TIM in the next few months," ARISS International President Frank Bauer, KA3HDO, said in a news release over the weekend. Bauer said ARISS has estimated that the cost of the 3-year development cycle for the new hardware is in the $200,000 range. He encouraged donations to the ARISS Challenge Coin Donation Campaign, announced this year at Dayton Hamvention. "The goal is to have this new system aboard ISS about 1 year from now," Taylor added in his post. "This assumes that ARISS can raise the remaining funds needed and that no delays occur in NASA testing and certification of the entire system." If you've never listened to a podcast before, download our beginner's guide. Next time: "Anderson Power Pole Connectors, and Antenna Polarization." Amateurs taking part in the ARRL National Parks on the Air (NPOTA) program are making a serious push to complete 1 million contacts from eligible NPS units before December 31. NPOTA crossed the 750,000 mark last week, and in just 7 days, more than 25,000 new contacts were uploaded to Logbook of the World, putting the year-to-date total at 778,000. Every US radio amateur can help NPOTA break the 1 million mark by getting on the air and working the Activators at parks, or by going out and activating an NPOTA unit! October 22 saw the first activation of the Edgar Allan Poe National Historic Site in Philadelphia. Ed Breneiser, Walt Skavinsky, KB3SBC, and Pete Kobak, K0BAK, braved rain and heavy winds to set up on the lawn of NS12 and managed to log more than 200 contacts from this exceptionally rare unit. Pete has been involved in activating some of the most sought-after and rarest NPOTA urban units. He will continue this streak by providing the first-ever activation of the Benjamin Franklin National Memorial Affiliated Area in downtown Philadelphia on Sunday, October 30. Forty-two activations are scheduled for October 27 through November 2, including the Selma to Montgomery National Historic Trail in Alabama, and the Longfellow House National Historic Site in Massachusetts. Georgia Section Manager Gene Clark, W4AYK, of Albany, has announced that he's stepping down at the end of October, after serving since October 2009. David Benoist, AG4ZR, of Senoia, has been appointed as Georgia Section Manager, effective November 1, to complete the current term of office, which extends until September 30, 2017. The very popular ARRL November Sweepstakes (SS) operating events take place in November on separate weekends for CW (November 5-7) and SSB (November 19-21). The contest period for each contest begins at 2100 UTC on Saturday and continues through 0259 UTC on Monday. Stations may operate for 24 hours out of the 30 hours available. Logs are due 15 days after each event. SS is a "domestic" contest that not only has broad appeal, but is within the reach of stations with modest equipment and antennas. Many stations enjoy operating in the QRP category each fall (5 W or less output). A consecutive serial number (leading zeros are not required). Operating category -- Q for Single Op QRP; A for Single Op, Low Power (up to 150 W output); B for Single Op, High Power (greater than 150 W output); U for Single Op, Unlimited, regardless of power; M for Multi-Op, regardless of power, and S for School Club. Check -- the last two digits of the year of first license for either operator or station. Many, if not most, Sweeps operators try for a "clean sweep" by working all 83 ARRL/RAC Sections, which count as multipliers for Sweepstakes, and earning a(nother) coffee mug for the shack shelf. The SS Operating Guide package, available for download, explains how to participate. It includes all rules, plus examples of log formatting. Clubs or public service teams thinking about giving Sweepstakes a try this year will find the guide a valuable resource. A new system for submitting club eligibility lists has been undergoing testing and is available online. Club secretaries can submit a list of eligible members by uploading a file or by copying and pasting from a list. Uploaded lists must include the club's full name; the club territory (center of the club's circle as a 6-digit grid locator or ARRL Section for medium and unlimited category clubs); the club's call sign, the eligible member's call sign, and a 6-digit grid locator of each eligible member living in and operating from the club territory. The deadline to submit an eligibility list is now the start of each contest -- November 5 at 2100 UTC in the case of SS CW, and November 19 at 2100 UTC in the case of SS phone. There's more information on how to do so. Complete sets of ARRL November Sweepstakes (SS) records for both modes are now available. Direct questions to ARRL Contest Branch Manager Bart Jahnke, W9JJ. The ARRL-affiliated Emergency Amateur Radio Club (EARC) in Honolulu held the first-ever Amateur Radio licensing classes and test session on board the battleship USS Missouri, now a World War II memorial berthed in Pearl Harbor. The October 8 test session was the culmination of 5 weeks of classes and a tour of KH6BB, the ship's club station. Eight applicants passed the Technician exam, and two of them went on to pass the General class test as well. Candidates included a couple living aboard a sailing vessel who wanted to be able to stay in touch while under way. Four military personnel wanted to get ham tickets, "so they would be better at their jobs," the club said. One military dependent always wanted to get licensed and "thought it would be fun," according to the EARC. A teen who had worked on a project in Alaska involving satellites also was among the successful applicants. A team of four EARC volunteer examiners administered the tests. After seeing service as recently as the early 1990s, the battleship was donated to the USS Missouri Memorial Association in 1998 and now is a museum ship. The vessel's radio room is home to KH6BB, operated by the Battleship Missouri Amateur Radio Club. ARES/RACES volunteers stepped up to support communication for the Clark County, Nevada, Office of Emergency Management (OEM) during the third US presidential debate in Las Vegas, Nevada, on October 19. Clark County OEM Chief John Steinbeck asked ARES/RACES to activate and support the county's Multi-Agency Coordination Center (MACC). Seven Clark County ARES/RACES members operated UHF and VHF voice as well as VHF packet and mesh VoIP from the MACC as well as from the Clark County IT Department communications van during the entire event. In addition, ARES/RACES members provided back-up monitoring of all event communications. 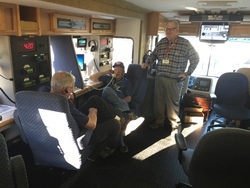 Among the Amateur Radio volunteers supporting the effort were ARRL Nevada Section Traffic Manager Jim Bassett, W1RO; Nevada Southern District Emergency Coordinator Jay Peskin, KE7EGO; Jim Davis, KF7GCT; Steve Deveny, KF7WGL; Frank Kostelac, N7ZEV, and Jack Cook, N8RRL. Also providing support from the communications van was ARES/RACES member Keith Aurich, KD7TOF, of the Clark County IT Department. What have been called "highly suspicious" VHF transmissions along the Bengal-Bangladesh border now are being considered signals of interest to India's Intelligence Bureau. After several days of monitoring, Ambarish Nag "Raju" Biswas, VU2JFA, told The Indian Express that he and his team have determined that the transmissions, taking place on Amateur Radio frequencies, are coming from the area of Basirhat in West Bengal. The voice communications have been heard at night. Federal Ministry of Communication officials in India had asked Biswas, the secretary of the West Bengal Amateur Radio Club, and his fellow hams to keep an ear on the strange VHF signals. Biswas told The Indian Express that he'd found the recent signals suspicious because he'd heard similar communications in 2002 and 2003. Subsequently, police arrested six "extremists," from Gangasagar, an island in the Ganges River delta, he told the paper. An earlier article in the Hindustan Times reported that the signals were being heard in the dead of night, with participants said to be in motion and speaking in some sort of code in Bengali and Urdu with a Bangladeshi accent. They also used numerical codes, according to the report. Indian Intelligence Bureau officials did not rule out the possibility that terror organizations were behind the signals. "The border of India-Bangladesh near West Bengal is porous," a senior Intelligence Bureau official told The Indian Express. "Smugglers and extremists try to exploit it fully." Central Kiribati T31W DXpedition Called Off, Contributions to be Returned: The Perseverance DX Group (PDXG) and T31W team have canceled plans to activate Central Kiribati (Kanton Island) in 2017. The DXpedition organizers pointed out that a three-person European team has already activated the rare DXCC entity this year, making some 30,000 contacts. The same group announced its intention to return to T31 in 2017 to finish the job. "Based on these events, it makes no sense for us to commit personal or donated funds to continue the project," the PDXG said in a news release. The PDXC/T31W team had announced plans last March to activate T31 next year. "When the news of this recent T31 activation became public, we considered switching to one of two back-up DXCC entities," the PDXC release said. "These alternatives are still under consideration." The PDXC said the nearly $3,500 already donated to the planned T31W effort would be returned over the next 30 days. 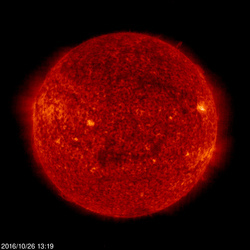 Tad Cook, K7RA, Seattle, reports: We saw a decline in solar activity over the October 20-26 reporting week, as compared to the previous week. Average daily sunspot numbers were 18.7, down from 31 in the previous 7 days. Average daily solar flux dipped from 83.4 to 76.9 over the same two periods. Geomagnetic indicators were up slightly, with average daily planetary A index edging up from 19.1 to 20.3, and the average daily mid-latitude A index moving from 14 to 16.7. One caveat: The mid-latitude A index values for October 22-24 are my estimates. Note the values in the left column for the mid-latitude A index: It appears that for more than 60 hours, a problem occurred in gathering geomagnetic data from Virginia. A -1 indicates missing data. The forecast from October 26 predicts solar flux at 78, 77, and 76 on October 27-29, 78, 80, 85, and 90 on October 30-November 2; 80 on November 3-6; 78 on November 7-10; 75 on November 11-12; 73 on November 13-16; 75 on November 17-19; 76, 74, and 73 on November 20-22; 71, 70, 71, and 77 on November 23-26; 80 on November 27-December 3, and 78 on December 4-7. Predicted planetary A index is 30, 24, 18, and 16 on October 27-30; 14, 12, and 8 on October 31-November 2; 5 on November 3-5; 8 on November 6; 5 on November 7-10; 10, 15, 18, 10, and 8 on November 11-15; 5 on November 16-18; 10, 32, 44, 40, and 22 on November 19-23, 18 on November 24-25, then 14, 20 and 12 on November 26-28, 5 on November 29-December 2; 10 on November 3, and 5 on November 4-7. Sunspot numbers for October 20 through 26 were 16, 29, 27, 14, 13, 17, and 15, with a mean of 18.7. The 10.7 centimeter flux was 74.7, 77.8, 77.5, 76.9, 75.3, 77.8, and 78, with a mean of 76.9. Estimated planetary A indices were 3, 2, 6, 9, 16, 60, and 46, with a mean of 20.3. Estimated mid-latitude A indices were 5, 2, 5, 18, 17, 39, and 31, with a mean of 16.7.